Hola everybody, this week will be the busiest weeks ever since 11/11 is coming. I will try to update as soon as possible when I have time to do so. 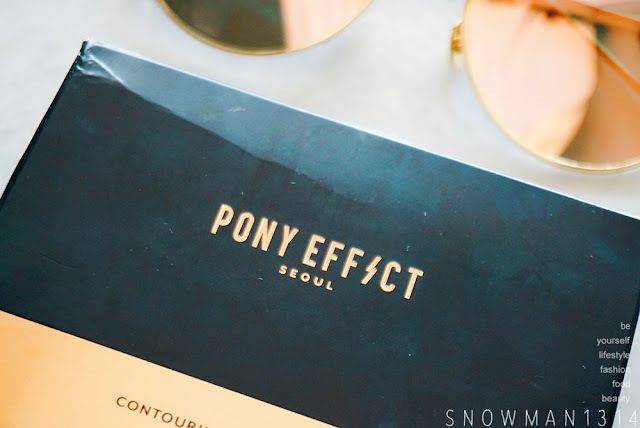 Today post will be sharing my another favorite beauty haul from Korea Make Up Artist Pony - Pony Effect Contouring Master Palette. I am a fan of Pony Make Up Artist, her skin is so flawless and she is so pretty. Her makeup is so on-point and inspired a lot of makeup geek like me! When she release this Pony Effet makeup products, I die die also want to try out her Pony Effect makeup product. I bought one her eye shadow last year December palette from their previous collection with Memebox. This time I manage to buy her contour palette and highlight brush too. 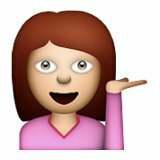 Both of my hauls is from Hermo.my. 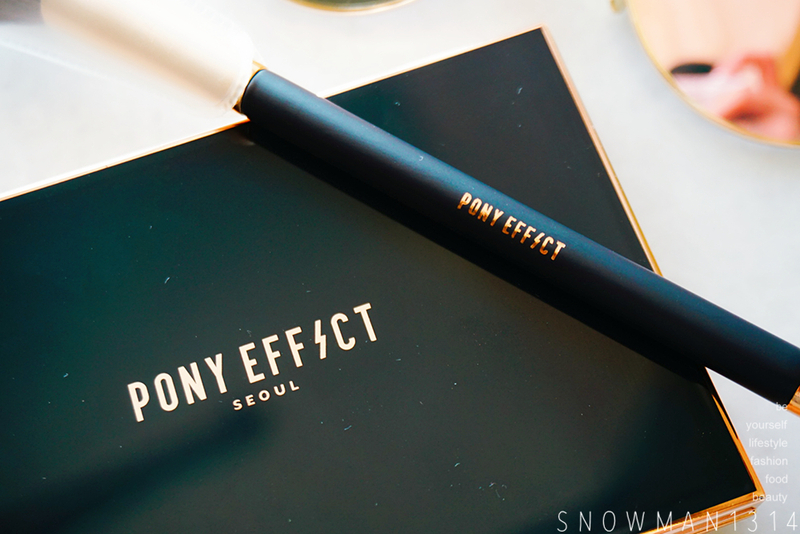 The packaging of this Pony Effect series come in elegant gold and classic black color. Gold surface is glossy and shines reflection whereas the black surface is plain black color surface. When you see the inside packaging of Pony Effect Contouring Master Palette, you will be totally in awe of their elegant packaging. Gold and Black is the perfect color combo for such luxurious packaging, even when you are using it I believe that everyone can't take their eyes away from the palette. The glossy Black surface on the top and the rest was in the gold color surface. 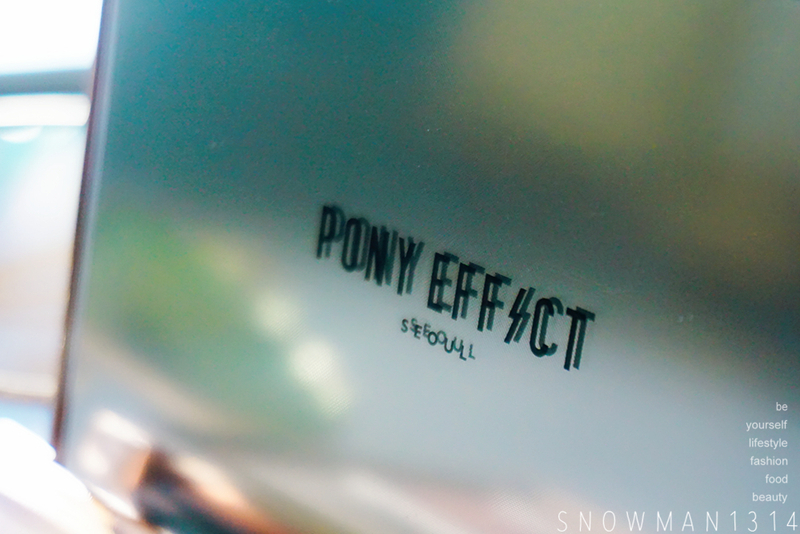 The opening design with a cute thunder sign which is the signature icon of this Pony Effect make up series. 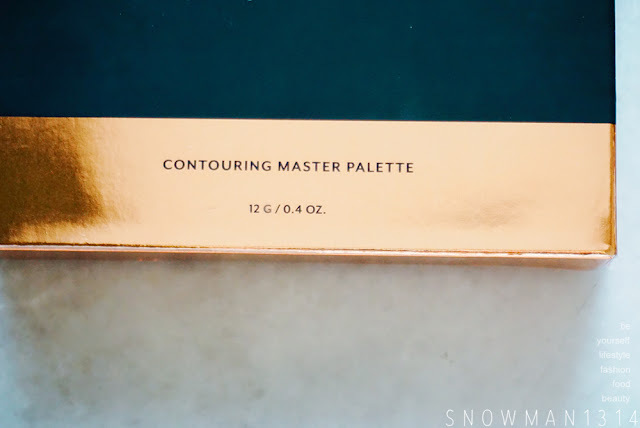 There are two types of color for you to choose from purchasing this contouring palette. 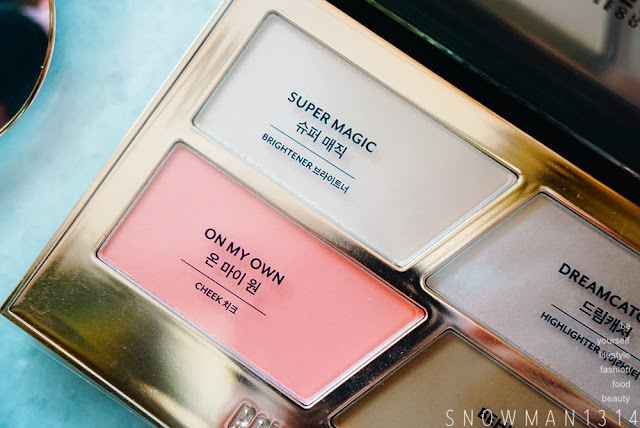 Where Fabulous comes in this pretty Pink shade for cheek, Pink Beige for Brightener and Diamon Pearl Pink for highlight and Marvelous comes in Coral Orange shade for cheek, Calm Ivory for Brightener and Gold Pearl Beige for highlight. Why do I decide to buy this palette? 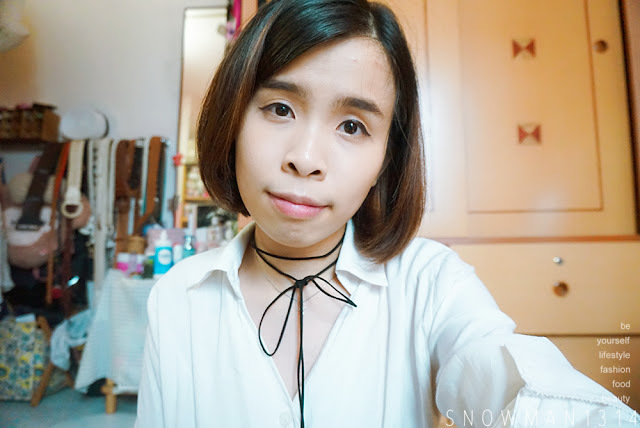 I myself do own the duo tone contour stick from Etude house as well, but I feel that the contour shading looks darker on my face and the color is not very long lasting too. Hence I decide to try a powder type of contouring and found this palette has a lot of good reviews plus the shading looks so much natural too! 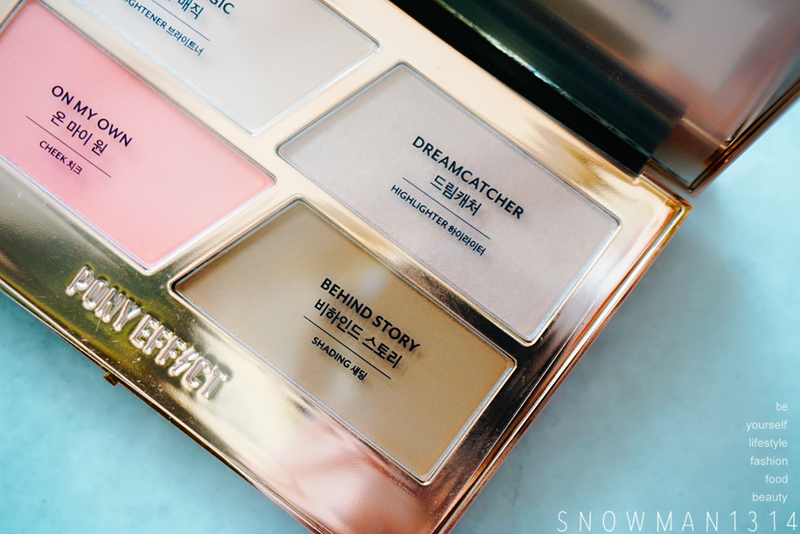 This Palette is so luxurious and exclusive until a point that I feel proud of using this baby and took quite a lot of photo of this baby too! 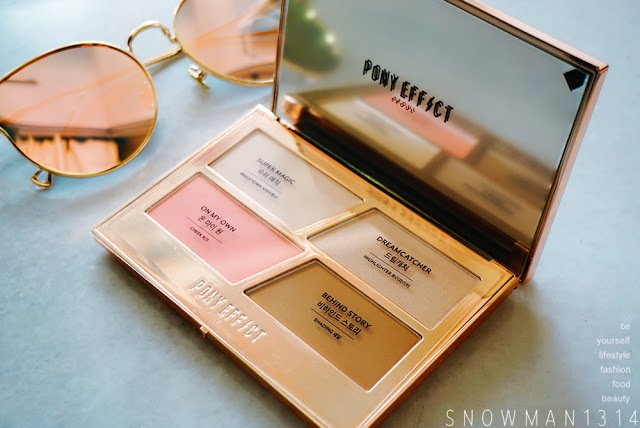 This Pony Effect Contouring Master Palette comes in 4 pretty pink color shade for brightener, highlighter, and cheeks! It consists of Fabulous comes in this pretty Pink shade for cheek, Pink Beige for Brightener and Diamon Pearl Pink for highlight. Each of the shade comes in really sweet and magical name too. 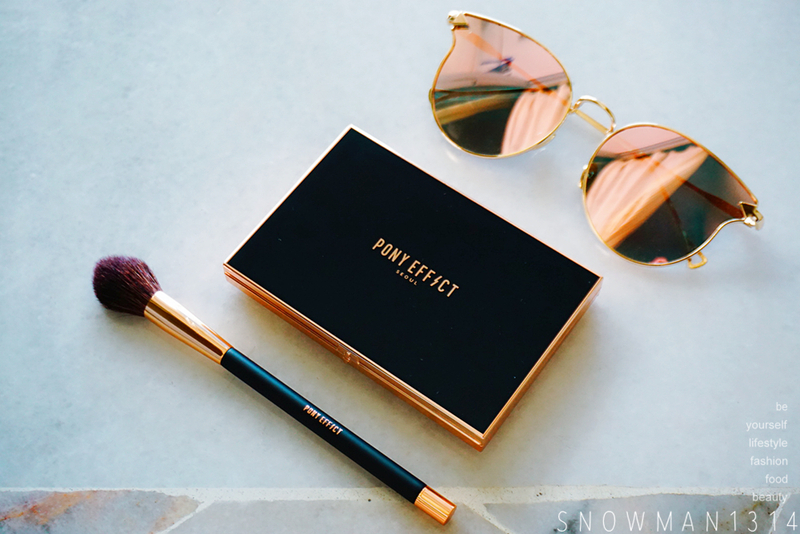 Another plus point for this contouring palette is, the palette is really convenient where you can have the blusher, brightener, highlight and shading 4 in one in this one palette. The palette size was not much bigger than handphone size too. Swatches on my hand. 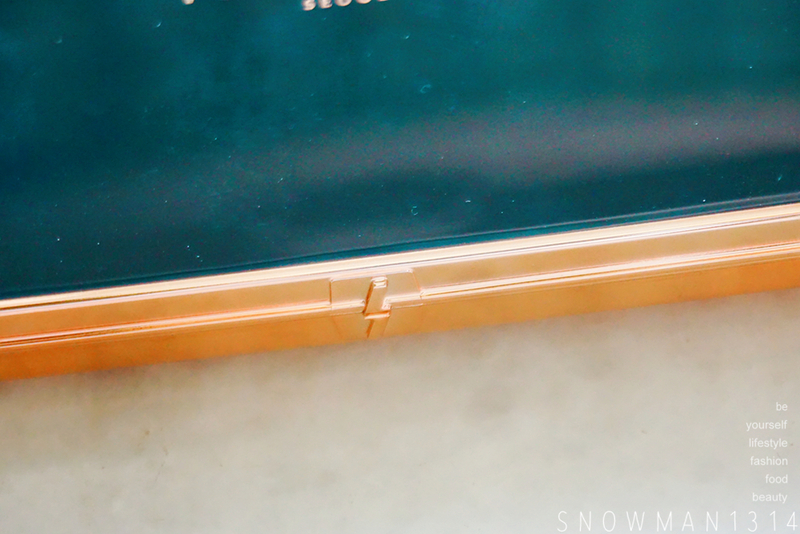 The color was really very pretty, is not too powdery but the color wise is very light. You might need to keep on apply and build the color on your face features. 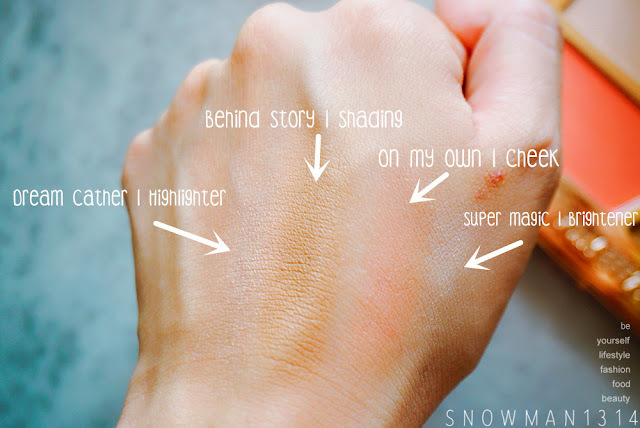 As for Brightener and Highlighter, the color is really pigmented and easy to build. For shading, although you need to build up the color slowly but I prefer to build the shading color this way. Where we can apply the amount we want, and start to create the natural contouring according to our face features. The color looks super natural too! So my next haul will be this Memebox Pony Effect Magnetic Brush Pro [#102 Highlighter Brush]. 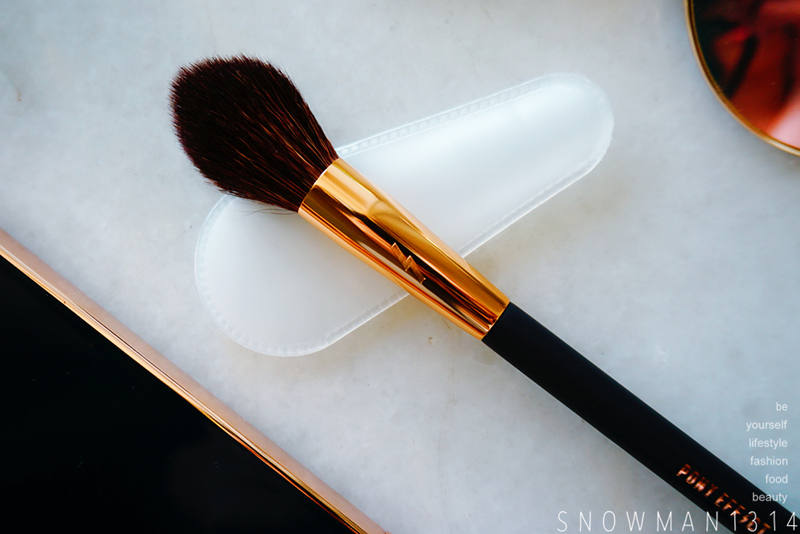 I always wanted to get a highlighter brush since I love to apply highlight on my face. I love how the highlight builds the glow on my face will look like after applying. 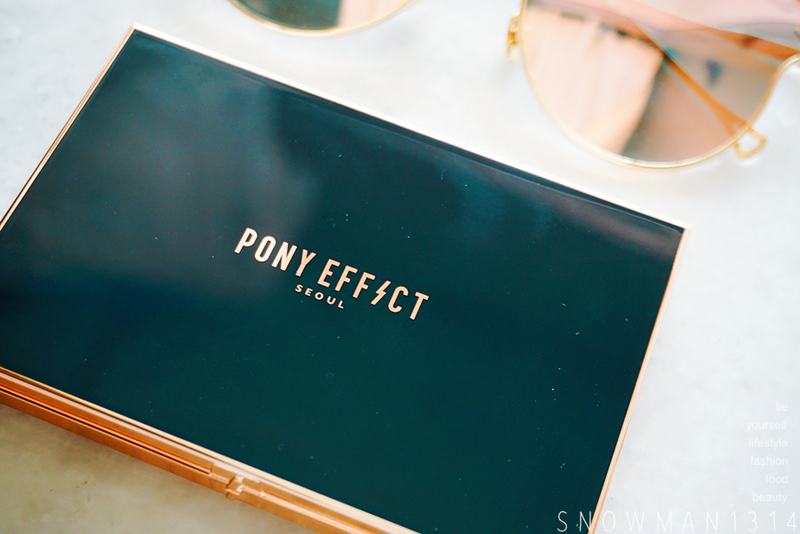 Both of the product comes in Gold Pony Effect logo name on it. Which I really like it, it reflects and shines through the product. 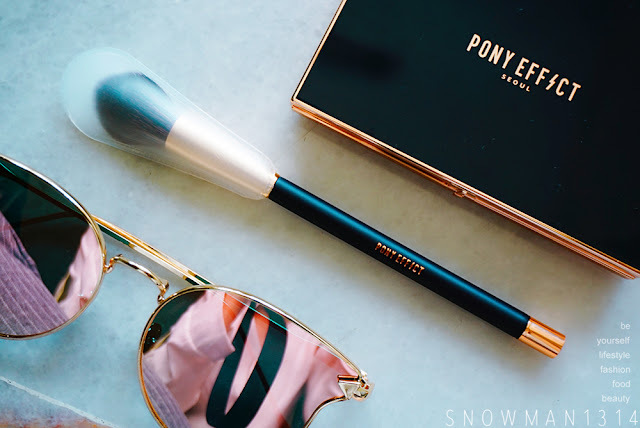 Pony Effect Makeup brushes are designed with magnetic ends, these brushes effortlessly stick to the magnetic plate or frame so you can focus on makeup application. 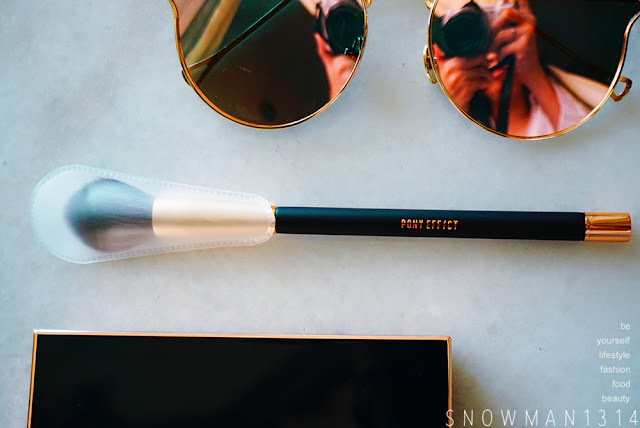 Comes in quality makeup brush made with fine quality wool with cutting optimize every stroke to complete a more professional makeup application. 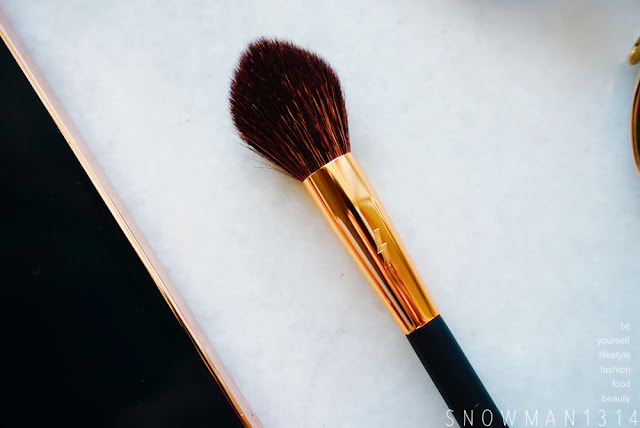 Highlighted Makeup brush comes in the triangular tip so that you can easily apply highlight on your cheekbone, along with the bridge of your nose, and cupid's bow. 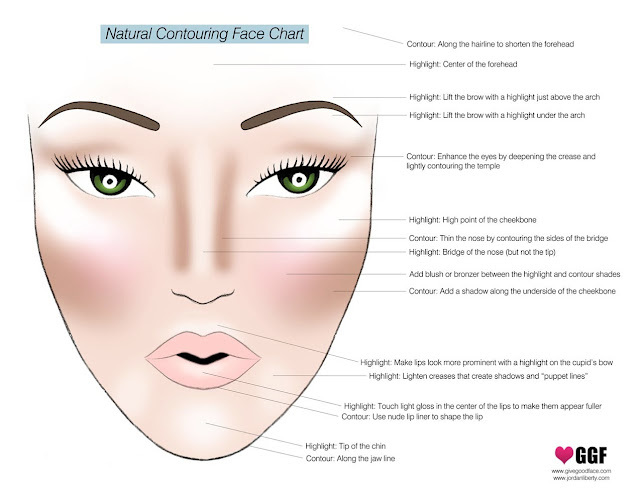 Here're some tips for contouring and highlight your face. Overall I am really loving this contouring master palette from Memebox Pony Effect series. 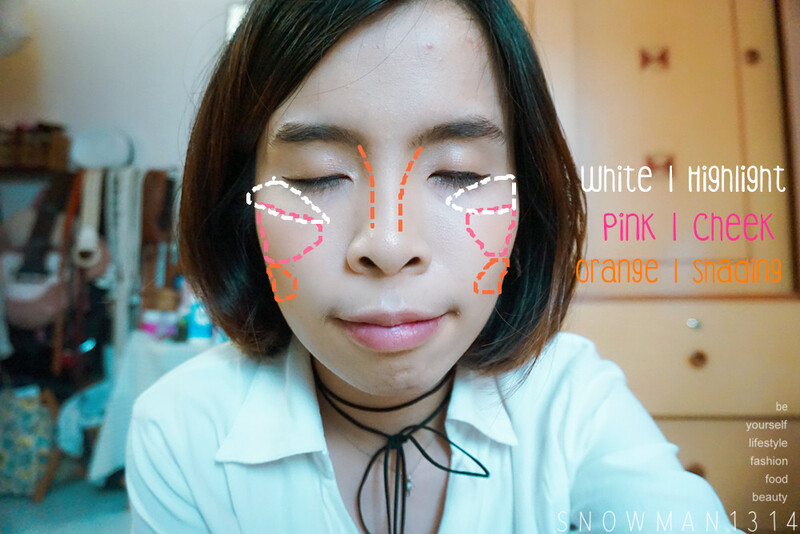 Face makeup only with foundation but not applying any contour and blusher. 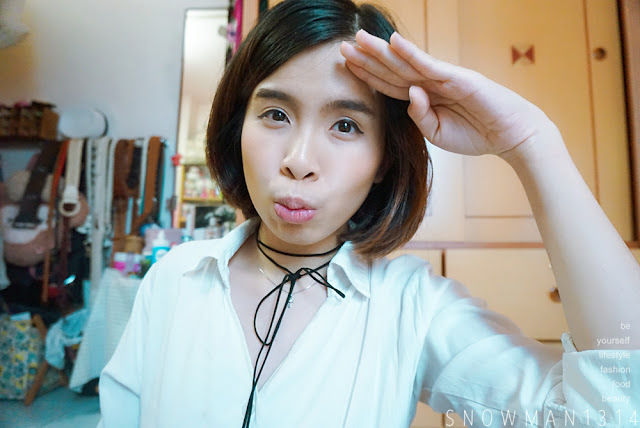 Here's how I contour my face with Highlight, Blusher, and Contouring on my face. My face looks much slimmer and sharper after contouring and highlighting! 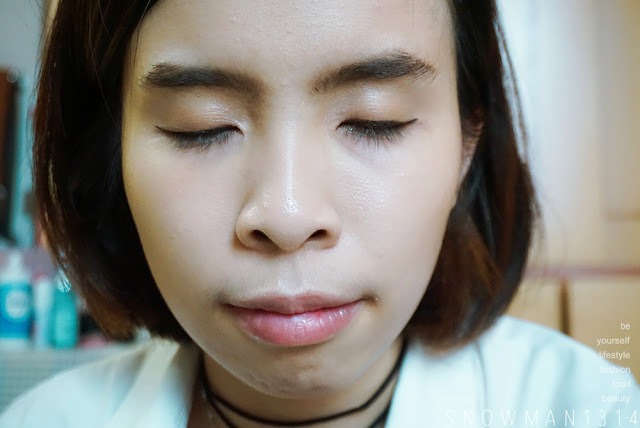 The effect is not too obvious but it gives the natural finish on my face. 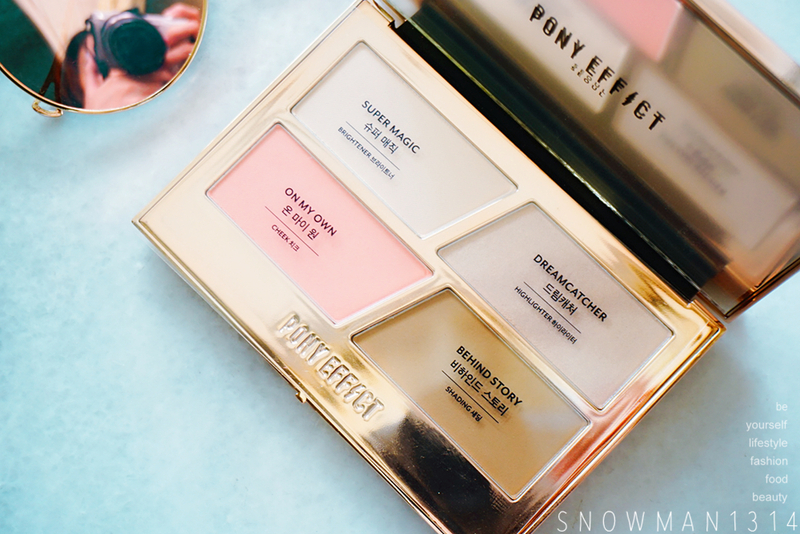 I am really liking this Pony Effect Contouring Master Palette. With its 4 in 1 function, I can easily create perfect face contour with this palette. 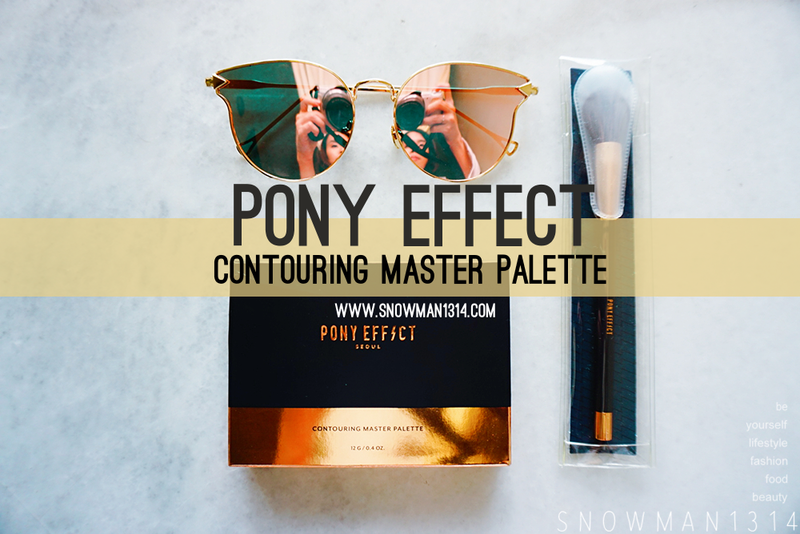 So if you liking this natural finish look after contouring, you can try out this Pony Effect Contouring Master Palette. I have sensitive skin. Do you think the palette will be compatible for sensitive skin? Good product, your face looks so nice and slim after use it..
OMG! <3 love the colors and definitely a pretty packaging! Yea!! I am total in love with their packaging!! Wow! Lovely shades. This should enhance looks. The makeup products look good. Will try it soon. great tips for a makeup noob like me. thanks so much for the post!! It really give a nice contour and match the skin color. The packaging is nice too. You are right that the colour combo makes this palette seem so luxurious and expensive. I am so impressed by how you managed to contour your face so well. I fail in it! korean products are pretty high quality, i would expect the same for this brand. Nice review. Yea I agree =D Always love Korean Product! Contouring is something I don't do much. Need to learn it. Nice shades! You look great with those makeup. Mom says I am too young to wear makeup.